This painting was completed shortly after her divorce with Diego Rivera. This portrait shows Frida's two different personalities. One is the traditional Frida in Tehuana costume, with a broken heart, sitting next to an independent, modern dressed Frida. In Frida's dairy, she wrote about this painting and said it is originated from her memory of an imaginary childhood friend. Later she admitted it expressed her desperation and loneliness with the separation from Diego. In this painting, the two Fridas are holding hands. They both have visible hearts and the heart of the traditional Frida is cut and torn open. 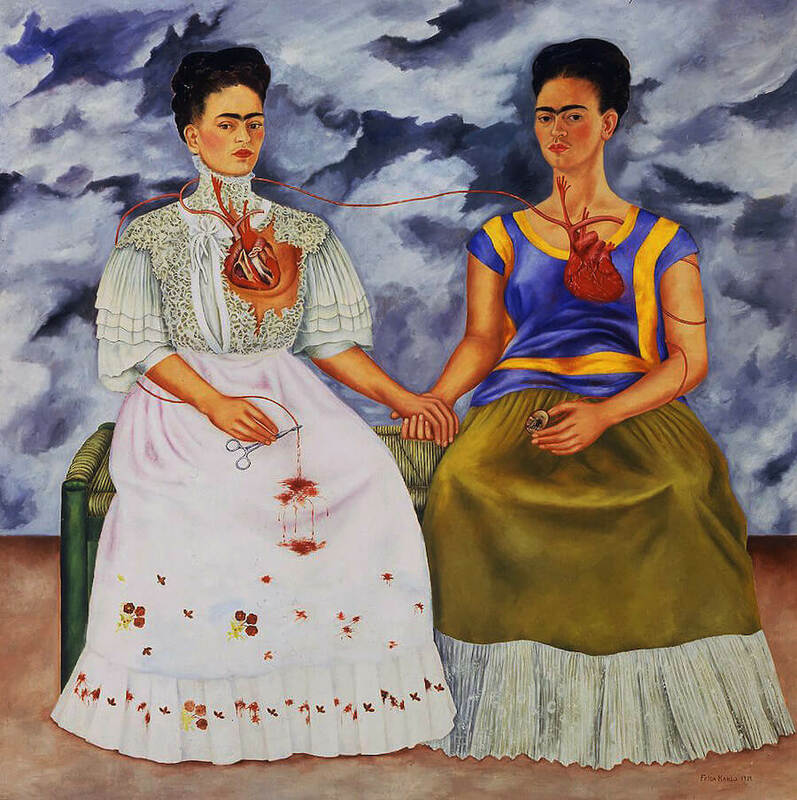 The main artery, which comes from the torn heart down to the right hand of the traditional Frida, is cut off by the surgical pincers held in the lap of the traditional Frida. The blood keeps dripping on her white dress and she is in danger of bleeding to death. The stormy sky filled with agitated clouds may reflect Frida's inner turmoil. In 1947, this painting was acquired by the Instituto Nacional de Bellas Artes (National Institute of Fine Arts) in Mexico City. The purchase price was 4,000 Pesos (about $1,000) at that time and an additional 36 Pesos for the frame. That was the highest price that Frida was ever paid for a painting during her lifetime. A reproduction of this painting is on display in the Frida Kahlo Museum in Coyoacan, Mexico.